On Wednesday February 4, 2015, the ESRD announced to the media that there would be a capture season this year in the Ghost Equine Zone. WHOAS along with the rest of the stakeholders were informed of this decision at the same time. The public outcry over this has begun and many people are attacking WHOAS as well, for what they perceive to be our stance on capture taking place. This post is to clarify exactly what WHOAS’s position is. In November 2014 when we signed the MOU with the government, which allows us to carry on the two programs we have mentioned in the past, (adoption and contraception), it was made clear to us that a capture season may occur in other areas outside the boundaries of our research area. We had truly hoped that this would not happen this winter. It was our belief that if a season did not occur, then when the annual aerial census was done in March this year it would quickly identify if the herds are increasing at the rates some say they are, are they stable or are they decreasing. However the decision was made to remove 20% of the Ghost Equine Zone herd which numbered 240 last year. This was a true disappointment to us. One of the things guaranteed to WHOAS was that the Sundre Equine Zone where our programs are being operated would not be included in any capture plans. Also, we were informed that area where the horses may be captured would be kept well away from our southern boundaries, assuring no interference in our work. Horse know no boundaries. In light of this announcement WHOAS was approached to see if we would be willing and ready to take some of the horses that may be captured this year. This was a no brainer–of course we will do whatever we can to save as many as we can. This is going to be extremely hard and heartbreaking as we are limited by finances and resources into how many animals we can take in. Finding good adoptive homes has proven to be a challenge in the past. Lots of people say they will but in the end they do not follow through and we have to continue to search for appropriate adoptive homes. We wish we could save them all however in reality this is not possible at this time. So we will do our best to save as many as we can. Now we can only hope that other individuals and/or groups will step in and help rescue more. In all the years that WHOAS has been operating we have stepped forward to rescue an extremely large number of wild horses that got themselves into trouble and/or were captured in previous capture seasons. Our site is almost complete but we are up and running and have stepped in to assure the safety of a band of seven horses. 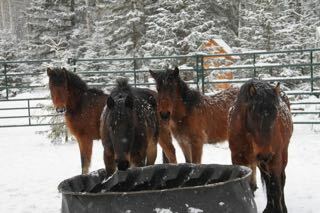 These horses will remain on our property and allowed to live out their lives in peace and safety. The filly and the colt pictured above were part of that group. We have begun to gentle them because eventually as in every wild horse herd, they would have been kicked out by the herd stallion. It is better to work with them now while they are easier to gentle. Part of the gentling process is to have them tied in a stall where they learn that their human caretakers offer them no harm and they become accustomed to our touch. As we move forward and begin to intake other horses from this capture, we will be needing more volunteers who are willing to devote their time to these horses. In dealing with wild horses, it is extremely important that they learn to trust their human counterparts. Therefore patience with soft hands and voice, become the best tools. Right now we have 2-3 experienced volunteers who have done this for many years. 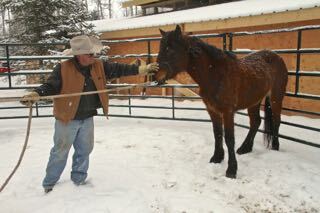 They are willing to pass on their knowledge and understanding of wild horse behaviour to those that are willing to learn. 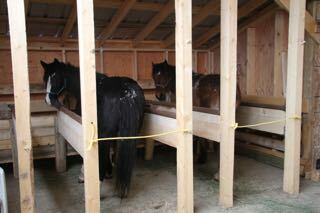 We will also be seeking adoptive homes for all the horses that we may have to deal with. The biggest thing to note is that these are wild animals and it takes a special person with the proper facilities to give the proper care for one of these beautiful animals. In the end though the new owner will have a truly loyal and trustworthy companion. 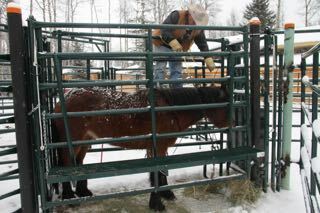 The work that WHOAS is doing is for the long term benefit of the wild horses. The ESRD understands this and that is the reason that they have allowed us 5 years to prove that both our programs can be very effective and humane population management tools. We know that we can show that in the long run that these projects are the future for sound management. Thus in the future, capturing of wild horse herds as it is being done now, will not have to happen. We have always and will continue to work for the wild horses. We have known many heartaches in the past and hopefully this is the last one we have to face. With continued support we will be able to overcome any obstacles and also succeed in our overall goals. If you feel that you can help and/or become a volunteer or provide an appropriate home, please let us know by contacting WHOAS at WHOASalberta@gmail.com.